BANGALORE: The results season is likely to begin on a low note. When Infosys announces its results for the December quarter on January 11, it is quite likely that it will once again reduce its dollar revenue guidance for the year. Brokerage firm Enam Securities says in a recent report that Infosys' December quarter is likely to be muted due to fewer new deals and the effects of Hurricane Sandy. "Hence, a downward revision in FY13 revenue growth guidance of 5 per cent is likely," it says. A report by brokerage firm Asit C Mehta says, "The company stated that significant challenges emerged after October. We do not envision a material improvement in the consulting and system integration environment very soon. Both these service lines continue to contribute 30 per cent to the total revenues of Infosys." The IT company provided a guidance of 8-10 per cent at the start of the year, but in July it cut that to 5 per cent. In October, at the announcement of its second quarter results, the company stuck to its guidance despite concerns that even 5 per cent may be too tough to meet. The September quarter had shown some signs of an upswing and Infosys sounded optimistic that it would be able to build on that. But Hurricane Sandy and worries around the fiscal cliff appear to have put paid to all such hopes. 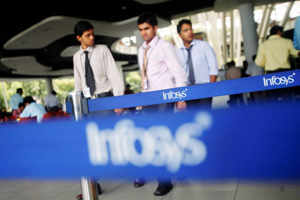 Infosys declined to comment on the matter saying it is in its mandatory silent period prior to its results announcement. Enam, which recently interacted with Infosys executives B G Srinivas, board member, head of Europe and global head of financial services and insurance, and Sandeep Mahindroo, principal (investor relations ), said the discussions indicated that the near term was challenging due to the tough macro environment and protracted recovery in the financial services and insurance vertical.